The Battle Badgers are an official Battlefront Ranger group. Which means we're available to teach Flames of War at your local game store, run demos at your convention, organize campaigns, and other various sorts of Ranger Events in order to get your Flames of War community growing. If you're interested in having us out for such an event contact Battlefront, and ask for the Battle Badgers. Of course we Badgers can only travel so far, but Battlefront has plenty of Rangers all over the world. So if you're not lucky enough to be in our area, chances are you've already got a Ranger group in your backyard. 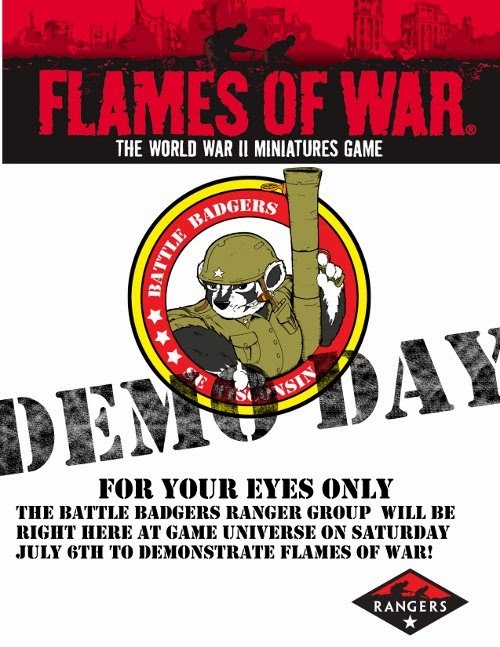 So what exactly is a Battle Badger Demo Day? Long story short, it's a convenient way for us to help grow the community for the game we love, and an opportunity to get this wonderful game rolling in your store. We agree on a day, we provide you with a nice flyer image to hang up, we advertise the event all over the place, then we show up with our portable demo table, and a painted Open Fire! set to teach anyone and everyone who wants to learn, how to play Flames of War. Each demo generally takes between 10 and 20 minutes. Battle Badger Lee introduces a few new players to the game. Our demo board is a suitcase that folds out to a 3 foot square. Our German Grenadiers prepare to Open Fire! The Battle Badgers host Tanksgiving on over 20 feet of gorgeous table at Outpost Gaming.